Notas dadas pelos hóspedes depois de sua estadia em: Apartment 28. 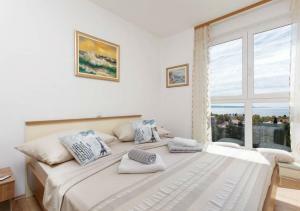 The apartment was in a good location,only 3 minutes walk to the nearest beach,and less than 10 minutes walk to the promenade. It had everything we could possibly need for our stay. Ivica, the owner,even left us a bottle of his homemade wine,and on our departure he drove us to the bus terminal. He had lots of information in the apartment regarding tours,restaurants, beaches etc. He was very helpful, and a genuinely nice man. I would give it 10+ if I could. The best stay during my 10-day trip in Croatia. It looks like someone own well-maintained modern home, and it does feel like home. 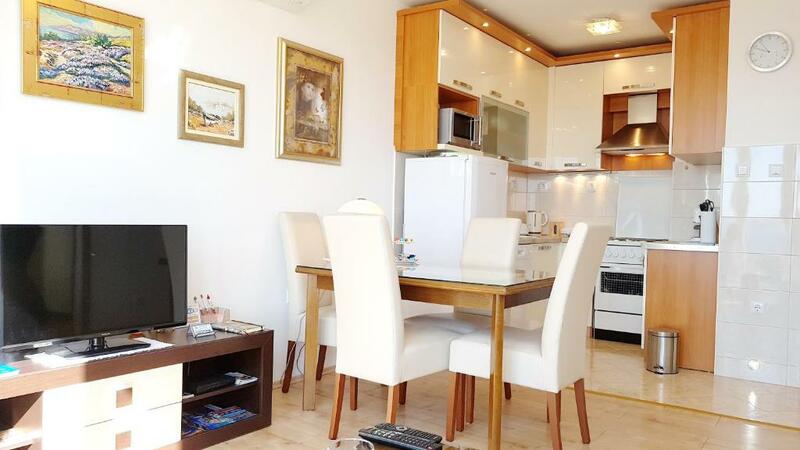 A well decorated one-bedroom apartment, with fully functioned living room and kitchen. All the appliances are the brands or types you would like to have for your own house. Owner also provides a lot of useful stuff, from tea/Nespresso coffee/juice/etc. to a bottle of wine to tourist information. He also meet us in person and help us find free parking. The location is also perfect. Less than 10 mins walk to the old town, and non-blocking ocean view directly from living room window. 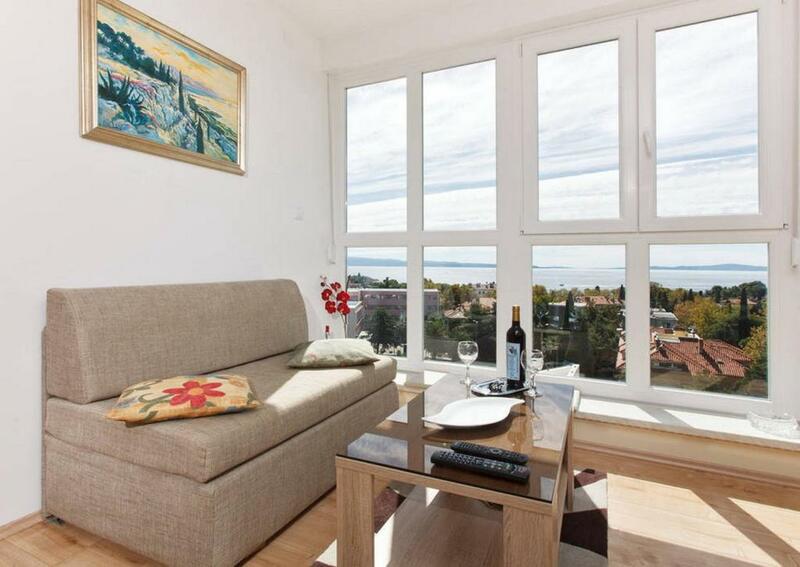 Don’t hesitate, it’s THE place you want to stay in Split! We had an amazing stay. Ivica picked us up and dropped us at the bus terminal, as well as providing us with everything we needed and more. We have stayed in many apartments on holiday over the years but this one is the best bar none. 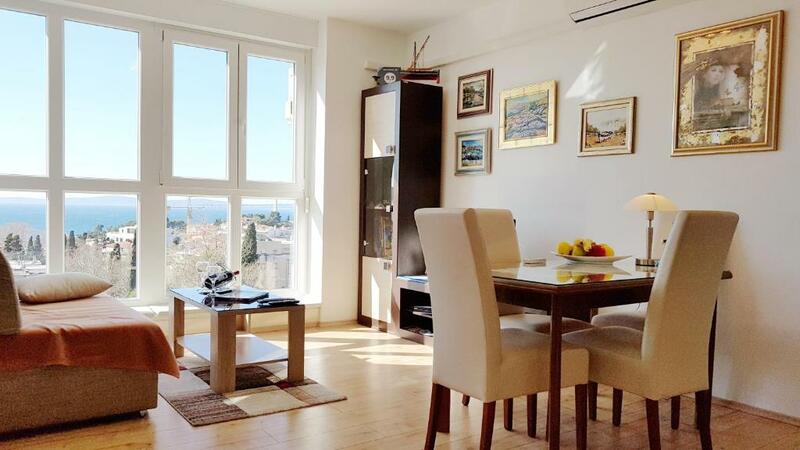 Ivica's attention to detail is outstanding, it's a super clean, very comfortable apartment within walking distance of beaches and Split old town centre. Ivica couldn't have been more helpful, guiding us to the apartment, securing parking and offering all the advice we needed. If there was a 10+++ category I would place this apartment and experience in that group. Highly, highly recommended. Great hospitality with personal touches along the way! Well stocked apartment in a great location. Would highly recommend to anyone staying in Split! You get very good service and help from your host at apartement 28. Before and during the stay we got good help. You will also find the apartment very clean with everything you need to make it a good home during your stay. Your host had also made availible very useful information about both Split and about the apartment and how to use it. The location was great and the wiew wonderfull. Walking distance to the city center and the beach. Split has good oportunities for shopping, sightseeing, beach & sun, good food and for enjoying the areas sorrunding it. Hvar city at Hvar Island was one om many nice trips we made. The people we meet in Split was very serviceminded and had good humor. Thanks Ivica, for apartment 28 and making our holiday great! This is a truly wonderful apartment and nothing has been overlooked. We would have no hesitation in staying here again. The view is excellent and there was even a pair of binoculars to view the scenery. The host went out of his way to ensure we had a smooth and trouble free stay. There are local amenities nearby for shopping and a really decent restaurant (Bakra) just a couple of minutes away. Town is about a 6 or 7 minute walk. Many thanks Iveca. Ivica was an exceptional host. His communication was very good and his attention to detail in the apartment exceptional.This is a wonderful apartment comfortable and in an excellent location. The views are superb over the bay. To many hosts renting an apartment is just a business for Ivica it is a hobby and it shows as he really cares about his guests having the best. We loved the place and will return. Highly recommend for anyone travelling to this beautiful country. By far the best apartment with one of the best views we have stayed in Europe. This is a very very well equipped apartment. Ivica is a great host. He has meticulously even created booklets informing about the things to do in Split and even about what things to find in the apartment. The view of the sea is superb. The apartment even has a binocular for you to spot the Diocletian palace. In the night, the sea lit by moonlight is what will keep you staring out at the window for hours !! Definitely worth recommending !! The apartment is well-located, about 10 minutes' walk from Diocletian's Palace, and about 5 minutes' walk from a sandy beach. 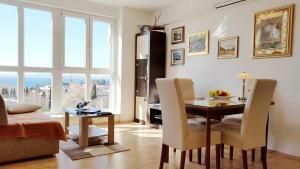 It is the best-equipped and most meticulously presented apartment that we have come across in Europe on this trip. There is a very clear view of the main bay around which the city is built. Our host, Ivica, could not have been more helpful. Garanta um preço incrível para Apartment 28 - avaliado como nota 10 pelos hóspedes recentes. Um de nossos campeões de vendas em Split! Situado no 7o andar de um arranha-céu, o Apartment 28 está localizado em Split, a 700 metros do Palácio de Diocleciano, protegido pela UNESCO, e a 400 metros da Praia Bacvice. Para sua comodidade, o Wi-Fi gratuito está disponível. 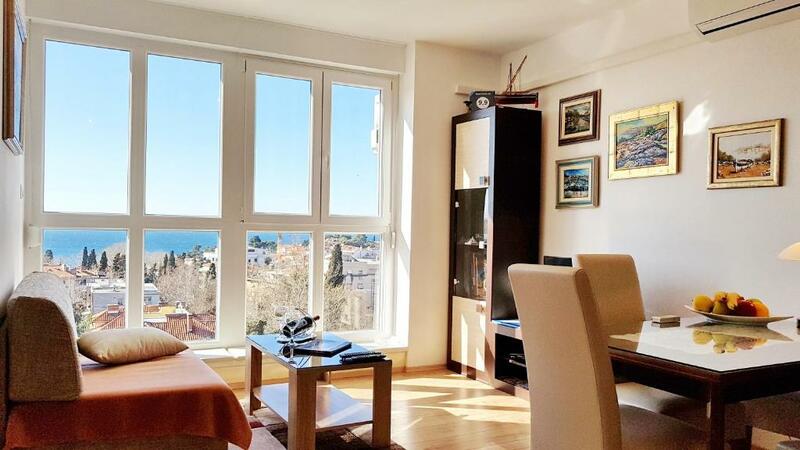 O apartamento dispõe de vista para o mar e para a cidade, área de estar com sofá e TV de tela plana a cabo. Há também uma cozinha compacta com lava-louças e área para refeições, bem como um banheiro com chuveiro ou banheira e secador de cabelo. No Apartment 28, o serviço de translado gratuito da Estação Rodoviária Principal está disponível. O translado para o aeroporto está disponível por um custo adicional. A Catedral de St. Domnius fica a 700 metros de distância e o Museu da Cidade de Split fica a 700 metros da propriedade. O Aeroporto de Split fica a 23 km de distância. Apartment 28 tem recebido hóspedes da Booking.com desde 16 de jun. de 2014. Quando você quer se hospedar no(a) Apartment 28? The Apartment 28 ★ ★ ★ has 34 m2 and is categorized with three stars. We are on the seventh floor, sunny side, with magnificent views of the city, the city port, Marjan Park Forest - symbol over the city, famous sandy beach Bačvice ,islands Brac, Solta, Hvar and Split Channel and it`s surroundings. The apartment consists of hall, living room, kitchen, bedroom and bathroom. 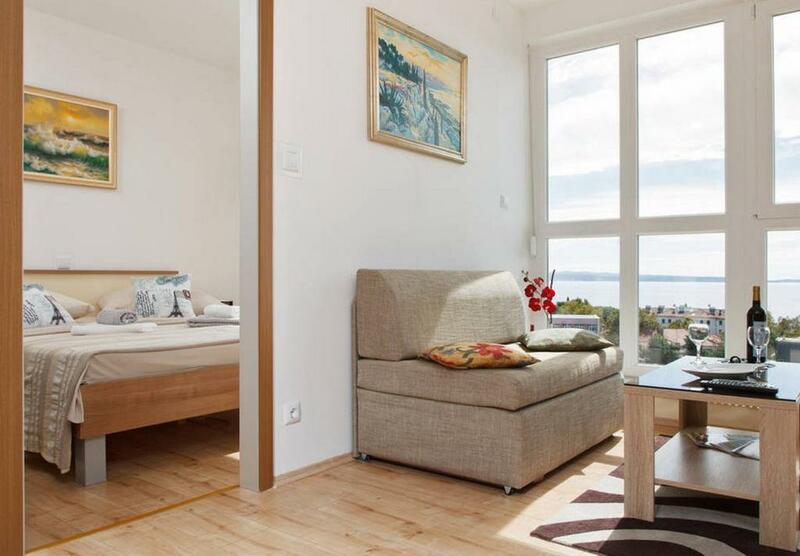 It has a double bed in the room(160 x 200 cm) and one extra single bed (sofa bed 110 x 90 cm) in the living room. Apartment 28 ★ ★ ★ is easy to find from all of traffic routes. We are located in Kralja Zvonimira 20 streets. From the bus station, train station or ferry port - to your accommodation (Kralja Zvonimira 20), it has 5-6 min. walking. 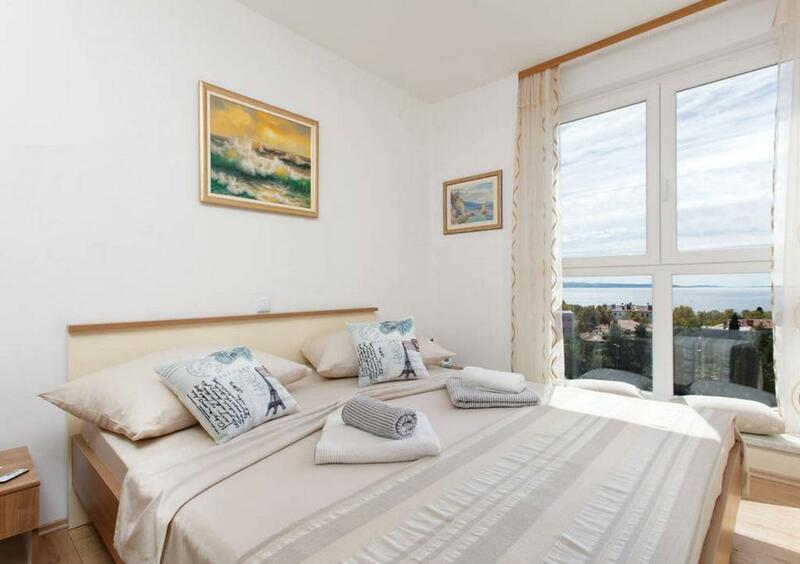 The apartment is completely renovated and equipped during the 2014th year. We offer: unlimited Wi Fi , Air Conditioning, Cable TV, WiFi, Dishwasher, Refrigerator, Stove, Microwave, Minibar, Electric kettle, Coffee maker, Washing Machine, Hairdryer, Iron, blankets and sheets, all the taxes and local tourist fee. All of this are in the price. Dear guests during your holiday make yourself at home! Dear Friends! I hope that I will be Your host in SPLIT - "the most beautiful city in the World and its surroundings :-)". After a successful twenty-year long and honorable military career in the Croatian Army (Croatian Air Force), I have decided to a second career in the field of tourism. Part of my free time I decided to give the tourists who chose the city of Split for your tourist destination and Apartment 28 for his accommodation. For this purpose I have renovated and equipped apartment and adjusted it to the needs of modern tourists. I have enough free time that I want give to my guests . When You arrive in Split I can wait for you at the Bus Station, Ferry Port, or at the Airport Split, and transfer You to the apartment. You could always contact me via e-mail, SMS, Viber, Whats App,... . I am looking forward to meeting You. Welcome to Split and in our Apartment 28. The Apartment 28 is in very nice, quite and green area – 6 min walking distance from the Center of town, Diocletian Palace, City promenade Riva and 3 min walking distance from the famous sandy beach Bacvice. Diocletian Palace have been on the World Heritage UNESCO list ever since 1979. Split is much more than glorious architectural scenery. Split is also a venue for excellent gourmet and vine experiences, numerous cultural happenings like film and theater festivals, exhibitions, excellent museums and concerts, a city which offers eclectic modes of entertainment starting with numerous clubs and bars, through street festivals to events such as Ultra Europe Festival visited each year by up to 100 thousand young people from around one hundred countries of the world. When you tire of the city bustle, there’s Marjan hill symbol over the city, with its forest, jogging trails, mountain climbing and biking, recreational terrains. Also very unusual to find in a city the size of Split are the numerous beaches with extraordinarily clean sea, from the well known Bačvice to the stone secluded oases’ all around Marjan. There is no place like Split! Your host Ivica. Bom saber Apartment 28 aceita pedidos especiais - adicione no próximo passo! Por favor, informe Apartment 28 com antecedência sobre seu horário previsto de chegada. Para tanto, você pode utilizar o campo de Pedidos Especiais ao fazer a reserva ou entrar em contato diretamente com a propriedade usando os dados informados na sua confirmação de reserva.